Despite the backing of a relatively weak economy, the German Army of the Second World War performed very well at a tactical level, at least for the first few years of the conflict. Many sound reasons have been advanced to explain this, with roots in the German defeat in the First World War. German officers studied the war and used the lessons to formulate improved weapons and tactics, including the famed Auftragstaktik (translated by the U.S. Army as “mission-oriented orders,” which sort of misses the whole point and is probably better understood as "devolved responsibility at all levels"). The French, having won the war, made far less sweeping changes. They retained many of the weapons of 1918, and used those of more recent vintage in very similar fashion. France stood ready to fight and win a repeat of the First World War; but unfortunately this was not the war they were called to fight. Our Second Great War alternative history setting was intended as an excuse to add more ships to our Second World War at Sea naval series (naval game players do like their ships). I never intended to apply the setting to our other game systems, but in writing the naval books I became enchanted with the use of counter-factuals to explore history, at least for my own amusement. While the agreement that ended the First Great War in our alternative history is the “peace without victory” sought by Woodrow Wilson, not everyone sees it that way in the years that follow. Germany and Austria-Hungary spin the result as “victory” and over the next two decades come to believe their own propaganda. Institutionally, their armed forces believe that they won the war and their preparation for the next means more of the same. France has suffered no territorial losses, even among its colonies, and has paid no reparations. France has even gained a small sliver of Lorraine. Wilson has negotiated what diplomats of an earlier age called a status quo ante bellum peace. But during the First Great War French politicians had promised that all of Alsace and Lorraine would be returned to France, and during the years that followed the “vile peace” became a sure-fire rage line to whip French voters into a frenzy of angry nationalism. Institutionally, it is the French Army in this historical offshoot that believes it lost the First Great War, and must undergo radical improvements in order to redeem both its own prestige and the lost provinces of Alsace and Lorraine. A highly influential work is Lt. Col. Charles de Gaulle’s Vers l’armeé de metiér (“Toward the Army as a Profession”) which strongly advocated for a force of full-time professionals rather than reservist citizen-soldiers, including a strong corps of armored units. DeGaulle felt that in order to be effective, armored units in particular needed to be manned by long-service regulars. To that end, the French Army’s term of service for conscripts is three years (historically, this was lowered to 18 months in 1935), but most technical positions are filled by long-service regulars. A strong armored component does indeed exist, in the form of armored corps each of two “heavy mechanized” (armored) divisions and one motorized division. An armored division has two tank regiments and two more of motorized infantry; as in our own reality, the organizers of the Second Great War do not yet have the battlefield experience to show that a higher ratio of infantry to tanks is needed. The motorized division has one tank regiment and three of motorized infantry. The material isn’t very different from that of our own history: Somua S35 cavalry tanks in the mechanized divisions and Char B1bis infantry-support tanks in the motorized divisions. In both cases, these expensive weapons have been supplemented with much cheaper tanks to help make up the numbers, Renault R35 and Hotchkiss H39 tanks. The French Army did not have a problem with the quality of its tanks in the actual 1940 campaign so much as one with the doctrine under which they were used. Germany has tanks as well, but these are slow and ponderous vehicles intended for infantry support and held at corps and army level. The tank brigades can then be assigned to support an advance or counter-attack as needed. The Imperial Army (including the semi-autunomous Royal Bavarian Army) does have some motorized cavalry divisions which include tanks, but these are nowhere near as powerful as the French armored divisions and somewhat smaller than the French motorized divisions. Another lesson of the Great War adopted by the Germans of our history comes in artillery. The Versailles Treaty forbade development of heavy artillery, but did not prevent Germany from producing new field guns and howitzers. Hyper-inflation followed by economic depression kept the tried-and-true 77mm field gun in the ranks for a decade after the war, but by 1929 the very fine 105mm leFH18 had been adopted, and equipped the light artillery battalions of German divisions by the time war erupted in 1939. This gave the Germans an enormous advantage over French and Polish divisions armed with the 75mm Model 97 or Red Army divisions with the 76.2mm in their equivalent batteries. The Germans had not been forced to give up their old 77mm guns – they replaced them in a conscious effort to increase the artillery’s firepower. In the world of the Second Great War, the 77mm gun has not been declared obsolete, and still equips the light artillery battalions of most divisions. The Germans have excellent 105mm and 150mm weapons, but the lighter weapons account for most of their guns. The standard 77mm field piece is only just starting to be replaced by a new and very capable 88mm cannon. Where the French of our history kept the 75mm Model 1897 in their artillery battalions, in this reality they have relegated the light guns to infantry support and equipped their divisional artillery with the Schneider 105mm, a very good weapon almost as good as the German gun. In both of these cases, the weapons remain the same (or pretty close to it). It’s how they’re used that changes. 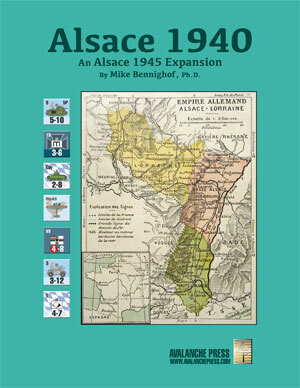 In our Alsace 1940 expansion for Alsace 1945, this shows up in a number of ways, and most are not particularly subtle. The French tank regiments are far stronger than the German tank battalions and faster as well. And there are a lot more of them. The French infantry is as strong as that of the Germans, who are presumed to have better-trained and better-organized foot soldiers but superior French artillery firepower evens the score. In Panzer Grenadier: Land Cruisers, French armor is much more effective than in 1940: The Fall of France, even though the exact same pieces are in play. The French now have armor efficiency and tank leaders in every platoon, while the Germans do not (the reverse situation from the 1940 game). French artillery is far stronger than in the 1940 game, French leadership is better, and French morale is better. The Germans are no slouches in any of these categories, but the disparities are no longer so evident in this alternative history. DeGaulle is often cited as a pre-war visionary of armored warfare, but he wasn’t simply a Gallic Guderian – he wanted a complete transformation of the military profession, rejecting the mass armies of the 20th Century. Tank would allow a smaller, professional army to wield the same striking power as one made up of millions of bayonet-wielding shoemakers. Land Cruisers and Alsace 1940 are by no means historical treatises, but they do allow a small counter-factual look at a couple of issues of military theory. I like that. Don’t wait to put Land Cruisers and Alsace 1940 on your game table! Join the Gold Club and find out how to get them! Mike Bennighof is president of Avalanche Press and holds a doctorate in history from Emory University. A Fulbright Scholar and award-winning journalist, he has published over 100 books, games and articles on historical subjects. He lives in Birmingham, Alabama with his wife, three children and his dog, Leopold. Leopold disdains theory.